PHOTO BY MARK CHAMBERLIN School 36 closed this year. The city is looking for a buyer. 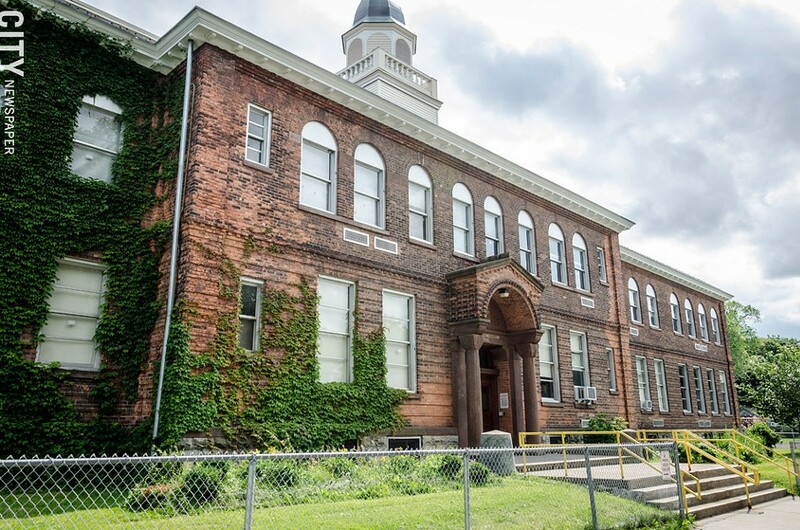 City Hall is looking for buyers for two of Rochester's oldest school buildings. Abraham Lincoln School 22 at 27 Zimbrich Street and Henry Longfellow School 36 at 85 St. Jacob Street are both in the northeast section of the city. The Rochester school district has closed numerous schools over the last 15 years because of poor academic performance, declining enrollment, or both. Finding buyers for the schools and new uses that resurrect the buildings as vibrant community centers isn't easy. In 2010, the City of Rochester found a developer to renovate and reuse the former Josh Lofton High School on West Main Street. The building is now residential and lavish office space in the city's downtown business district. The Rochester school board has approved the relocation of School 22 to the Franklin Educational Campus at 950 Norton Street. The building itself is being phased out. Built in 1916, School 22 is a wood-frame construction and contractors did not recommend making it part of the school district's ongoing $1.2 billion project to upgrade city schools. The decision angered State Assembly member David Gantt, who has been instrumental in getting funding for the project approved in Albany. Gantt was concerned that too much of the project money would go to schools in the wealthier southeast section of the city, while schools in the poorest neighborhoods are ignored. School 36 is less controversial. The school board and Superintendent Bolgen Vargas agreed to close the school, which was built in 1898, because of its age and poor academic performance. The school closed this year. Both school properties were returned to the city, technically the owner of all city schools in Rochester. The asking price for each property is $1.5 million and the city says it will give preference to buyers who say they won't ask for tax exemptions. That could put some logical buyers, however, such as charter school operators, affordable housing developers, health care facilities, or other nonprofits at a disadvantage. And both properties are located in the 14621 neighborhood — an area of the city that has been stymied by low employment, lack of investment, and crime. In its requests for proposals — packages that city officials put together for developers that outline what they're looking for — the city says that it wants projects that increase the city's tax base, complement surrounding development, and stabilize and preserve the land values of the surrounding neighborhoods. "Schools have closed in the past and we have found ways to put the buildings to good use," says city spokesperson Jessica Alaimo. "The mayor's top priorities are to improve access to jobs and a quality education, and make neighborhoods more vibrant. These priorities will be the top consideration as we review the proposals." The city will hold information meetings on the buildings from 2 p.m. to 3 p.m. on Wednesday, July 15, at City Hall, 30 Church Street, room 223-B. Proposals from prospective buyers for both sites are due no later than Friday, September 11.